Double zipper design makes it more convenient to use and prolong its service life. Made of oxford cloth, waterproof, moisture proof, durable and water-resistant. 2-layer design with large capacity, easy to hold your fishing tackle like fishing rod, line, float box, etc. With hand carry strap and adjustable shoulder strap, suitable for hand and one-shoulder carry. Folding design for carrying and storing convenience. With two exterior pockets and one mesh pocket to hold lures, tackle, knives, bait and more. 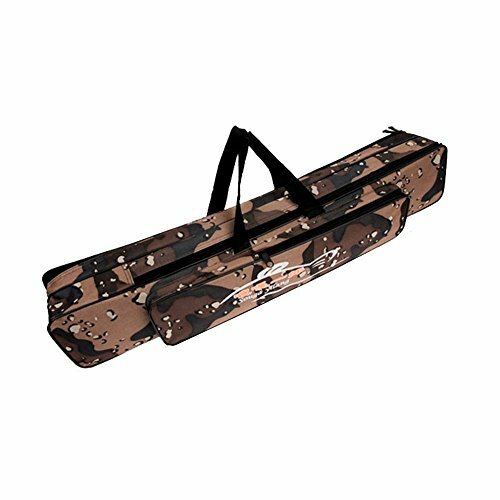 Fine-made fishing bag with exquisite workmanship and fashion camouflage appearance.